Have 2 mats for Fleet Commander (Space Fleets no puny earth ships that is). But then I am not so much of a Tabletop Aficionado compared to most other Veterans here…have only 6 games to my name (11 if you count the different Ascension CotGS as standalone games). What is that game? 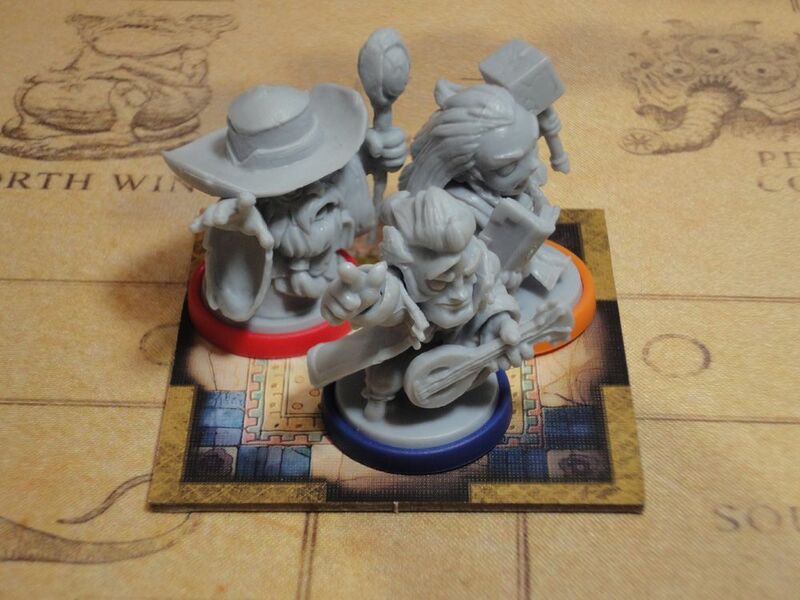 Arcadia Quest or Super Dungeon Explorers? It looks cool. Good eye! It’s their (CMON) dungeon crawler based on Arcadia Quest, Masmorra: Dungeons of Arcadia. My understanding is that they took an existing game and adapted it to their Arcadia Quest theme. With Arcadia Quest being so popular, the Masmorra Kickstarter was heavily subscribed, meaning that the BGG Marketplace has retail copies for cheap, and Kickstarter copies for reasonable cost. That run had Valerie, Human Cleric, Algus, Human Wizard, and Travis, Human Bard (one of the Kickstarter heroes). It has been two weeks now since I got to play Terraforming Mars, and I’ve still been thinking about it. Coincidentally, my copy of the game plus Preludes just arrived in the mail yesterday, so I’m excited. I wouldn’t call myself a Magic: The Gathering Player in the sense that I’ve ever paid much attention to the pro scene, or have been involved in any organized events, or anything like that, but all through college I played many games a day with my roommates and have quite the collection of thousands of cards, so I’m quite the MtG fan. I bring that up because in some strange and abstracted way, Terraforming Mars feels like a great Magic alternative to me. The engine I built in my one play was just so interesting that I was immediately thinking of card combos and every draw was immensely exciting. There are plenty of card battle games out there that can be Magic alternatives, but there aren’t many board games that give you a similar feel of a CCG while still being a decidedly non-card battler. Terraforming Mars somehow did that. If you gotta pay attention to the pro scene to be a “Player” I guess I never was one, either. I think pro scenes are toxic to games of all kinds. Agreed, but I just wanted to clarify my involvement with Magic. Simply saying “I played Magic: The Gathering” can certainly imply that I went down that rabbit hole. I’ve been playing it since release and am discovering new combos every game. There are still individual cards that I’ve only ever really seen used once, but to great effect. The game offers a lot of variety even if you play the same corporations over and over again. I did my "New to Me Games - March " post. Eight whole new games thanks to that convention last weekend. We played Arkwright with the spinning mule variant. This allowed a shorter game at 2hr30 although both new players had watched tutorials so there was no teaching. Spinning mule is like the spinning Jenny version but with some of the extras from the water frame version. This seemed about the right depth for both new players who have enjoy heavy games, while keeping the focus on the dynamics of the market mechanic. Arkwright is definitely something I would like to try once. The Estates is the best financial throat-cutting possible in half an hour of an evening. I just had what I assume is an atypical first game of estates against players who had played before. I picked up a couple of consents cheap and used them to reduce the play field instead of expanding it. I had points on the board and forced the end of the game by drawing a roof so the cash rich player would finish the row with both our buildings in it. Embezzling hasn’t made enough of a difference in our games; the winners so far have been decided by points differentials too sizable for embezzling to matter. It does depend on the meta though. Extremely tight play and favourable cube distribution means you can invest in two companies and do well, but the more involved you are the more exposed you are. 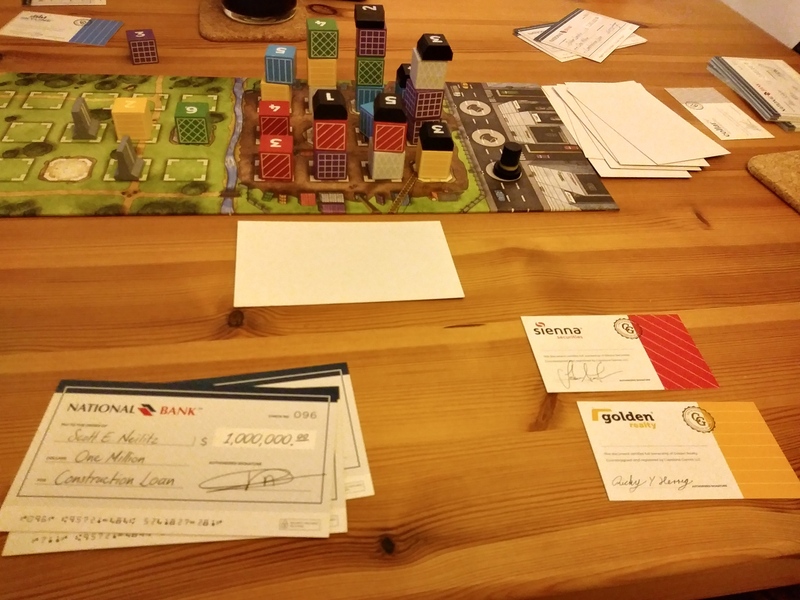 I currently like investing in one, auctioning off permits, the cancel block, and the mayor’s hat, early for speculative profits, and then capitalising on that with some nice rooftop points. Wrapped our Pandemic Legacy Season 1 which has been running for almost 2 years. I just broke out King of Tokyo to teach to my 6 year old. My wife had an ability that let her spend cubes to negate damage and my son was absolutely terrified of ending up in Tokyo and wouldn’t attack her. It was shaping up to be a runaway victory for my wife since she really wasn’t being punished for staying in the city. Then my son bought a card that cave him 9 victory points for rolling one of each symbol. Sure enough, he rolled that on his next turn and won the game. He was doing victory around the house. Had a boardgaming weekend that was just okay until last night, when I finally got to break out Terraforming Mars to three new players. We played once, they all loved it, and we played again. They all loved it again, and there was perhaps thirty seconds of discussion on playing something else before they decided to play again. We finished that game, and made it to bed at about 4 a.m. after discussing them at length. We dissected the games and our various fortunes in them all this morning before going home. We all enjoyed those games more than any other from the whole 5ish days we were there, and couldn’t stop mentioning possibilities and good and bad fortune. We’re planning to meet up to play mid-week, and at the weekend. I don’t know if “engine building” is a true mechanic as it exists in some way or another in many, many games, but there are some that are clearly more focused on developing a working engine with synergy between the moving parts. Magic: The Gathering, Race For The Galaxy, Terraforming Mars, etc. I want Wingspan, but have yet to get my hands on it. What are some of all your favorites that represent the mechanic best?